Welcome to another #tbt Throw Back Thursday! Today's Curried Pumpkin Soup recipe was originally published way back in October 2011. A few months ago I started going through all the posts on TEM with my handy Grammarly App and correcting any grammar and spelling mistakes that popped up. As I've been going through this clean-up process, I've found lots of great recipes, with terrible and embarrassing photos attached to them. I've decided to bring these great recipes alive again with some new photos. The original photos of this curried pumpkin soup I submitted to Tastespotting and Foodgawker about ten times each. I kept tweaking the photo slightly each time, and I just couldn't figure out why they kept denying them. They must have been howling in laughter wondering what the heck I was thinking. The original photos are lopsided, blurry and have a weird bluish tint to them. You have to check them out at the bottom of the post! I wanted to share this curried pumpkin soup with you, but I didn't want you to have to face those pictures. The soup is warm and creamy with a hint of spice, just the way curried pumpkin soup should be. The best part about the soup is the caramelized onions. 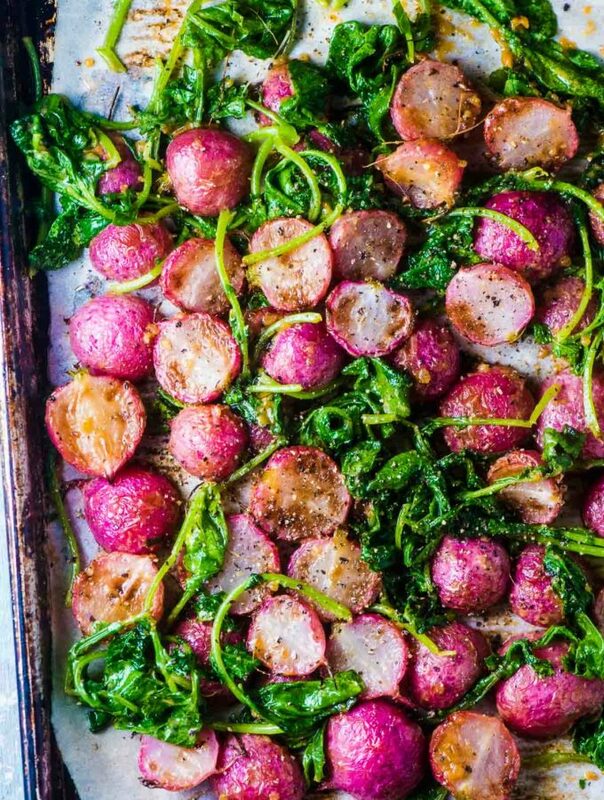 Whatever changes you make to the recipe, please don't leave out the onions. They're crazy delicious. There's something about seeing leaves fall from the trees that makes me crave soup. Could also be the chill in the air that always accompanies the falling red and orange and yellow leaves. As pretty as this time of year is, I am a summer kind of person. I get chilled quickly but can't stand being bundled in sweaters and socks. I spend most of the autumn and winter battling between chilly toes and socks that make my feet feel trapped. It's an endless battle that neither side wins for long. But that's enough about my peculiar (I think?) obsession with having my feet bare. This curried pumpkin soup is warm and comforting; they're cliche words, I know, but true. The spicy curry is mellowed by the sweet pumpkin and the apple. Although this soup is great on its own, the real star of this show is the Maple and Ginger Caramelized Onion. Please don't leave the onions out of the soup. Like a lover or a best friend, it wouldn't be the same without them. This curried pumpkin soup is easy enough to make on a chilly weekday evening, but will hold its own at the start of a dinner party. Last year at Thanksgiving I carved out fourteen mini pumpkins and ladled the soup into them. The presentation was well worth the work. Today I sit at my new (hooray it finally arrived!) dining table, surrounded by paperwork, eating the same soup. The presentation isn't so pretty, but the soup is just as satisfying. Well, it's almost as satisfying; I love the presentation, and if I had a mini pumpkin on hand I'd probably hollow it out and ladle my soup into it. Just for fun. In the past, I've made this soup with almond milk instead of regular milk and it has turned out great. This time when I pulled the milk from the fridge it had turned lumpy and sour. Needless to say that milk went down the drain, and 3 cups of water went into the soup. It still turned out great, so I will probably leave the milk out next time to make this already healthy recipe a little more healthy. 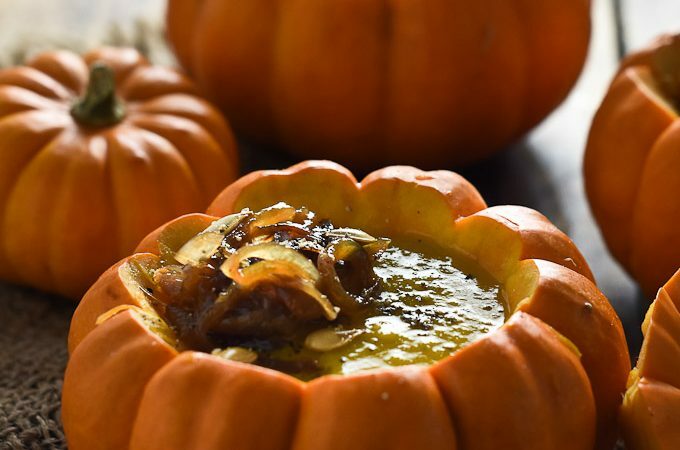 If you make this Curried Pumpkin Soup with Maple Ginger Caramelized Onions, make sure to snap a pic and tag @theendlessmeal on Instagram so I can like and comment on your photos. I love seeing TEM recipes you create! 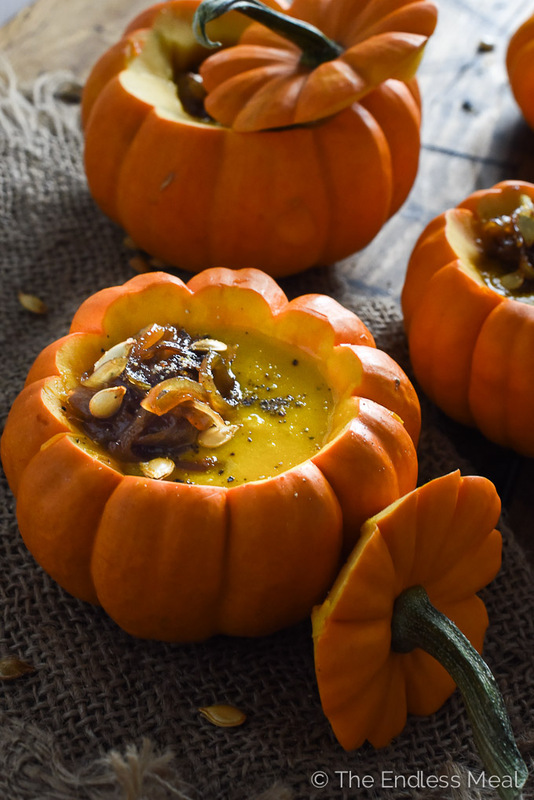 Curried Pumpkin Soup with Maple Ginger Caramelized Onions is a delicious fall treat. 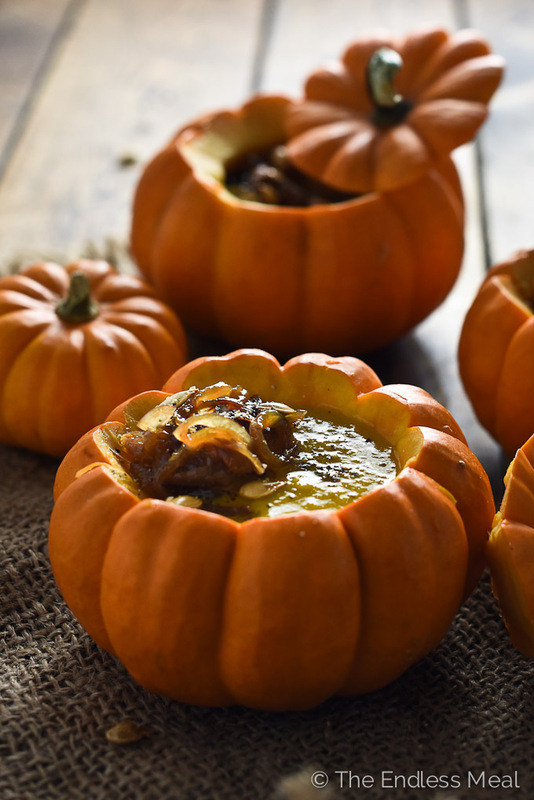 Serve it in little pumpkins for the cutest dinner party bowls ever. To serve, ladle the soup into bowls (or mini pumpkins) and top with caramelized onions and croutons. Enjoy! If you're interested in learning a few tricks that I did to improve my food photography, check out the posts 10 Food Photography Tips for New Food Bloggers and The 10 Best Food Photography Props to Improve Your Food Photography. This looks absolutely amazing, I’m definitely going to make this soon. What kind of apples do you think would taste best? Oh my word, I LOVE that you served these in pumpkins! Plus caramelized onions make EVERYTHING decadent. Nom nom nom. Funny, I just roasted a butternut squash last night. My hubby came home and nibbled on it, so I need to buy more or some local pumpkin. Curry flavor was in my mind, so this is maybe going to be dinner tonight. Dont have any apples and may not be able to get any this afternoon, but can figure something out, I’m sure. Also, may use a little bit of fresh scotch bonnet rather than red pepper flakes. Scotch bonnet and habenero are populare here in the Caribbean. Also won’t be able to find any cute small pumpkins to serve in, but it will be delicious. I love scotch bonnets … so spicy and delicious! It is! It’s a great way to have a little laugh at ourselves. I’m happy to hear I’m not alone! That is one perfect soup! The curry made sweet with the maple and caramelized onions…swoon! I love going back and looking at old photos. Well, love and hate. It’s hilarious because you’re like what was I thinking, but it’s cool to see the progress you’ve made. Pinning this! It’s love hate for sure. Mostly love, with some cringes. 🙂 Thanks for the pin! I am making this!!! 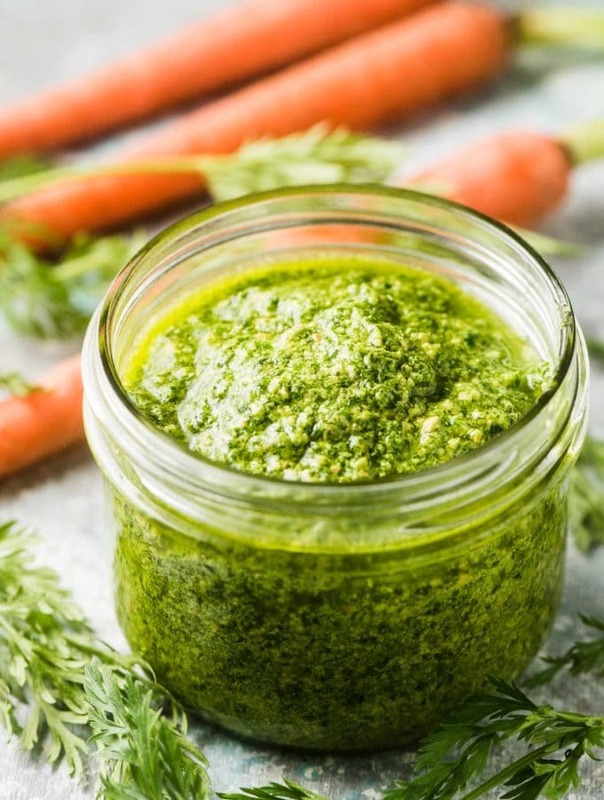 Sounds delicious….as do all the recipes on your site. And I agree with you about the onions. As a kid I was never allowed to have onions (my dad hates them!) so now….well, sorry dad!! Thanks Kristen! As a vegetarian I will be coming back to your site again and again!!!! He doesn’t like onions? Gasp! Let me know how you like the soup when you make it!! It’s so pretty served in the pumpkin! I’d rather not have to bundle up either, but I am ready for a break from our summer heat. And, I’m ready for fall soups like this! Congratulations on your blog, I will be checking this out regularly for new and exciting cooking ideas. Soups are one of my all time favorite things to make in the autumn months. Love the ginger caramelized onions in your soup. 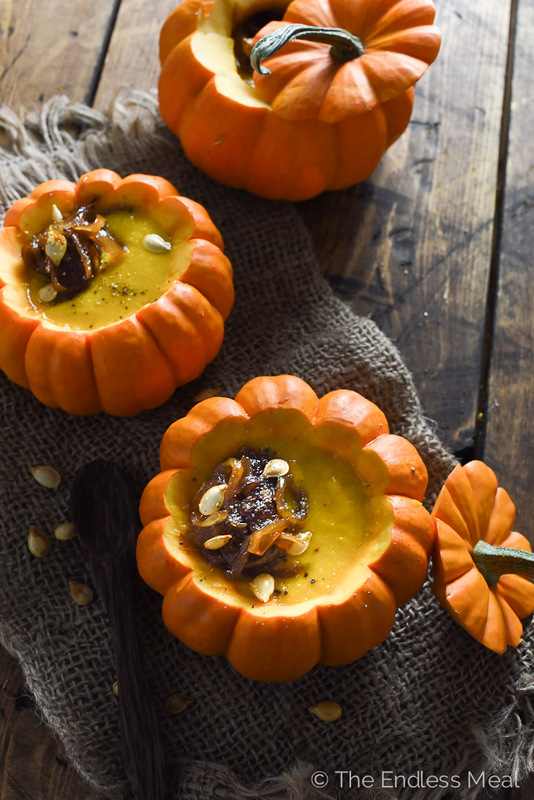 Serving this soup in mini pumpkins is such a cute idea, perfect for entertaining. This soup recipe is making me hungry! Thanks for sharing it and we’re going to try it out tomorrow night! I’ll let you know how it goes – I don’t know if we’ll be as fancy with the pumpkin though. Nice touch! This time of year always has me craving soup too. I always figure that any excuse to entertain is a good one. I hope your guests like the soup in pumpkin bowls as much as I do!! I love The Juice Truck! I didn’t know they do a sweet potato and ginger soup. Next time that’s what I’ll try for sure. Thanks for the awesome suggestion!! 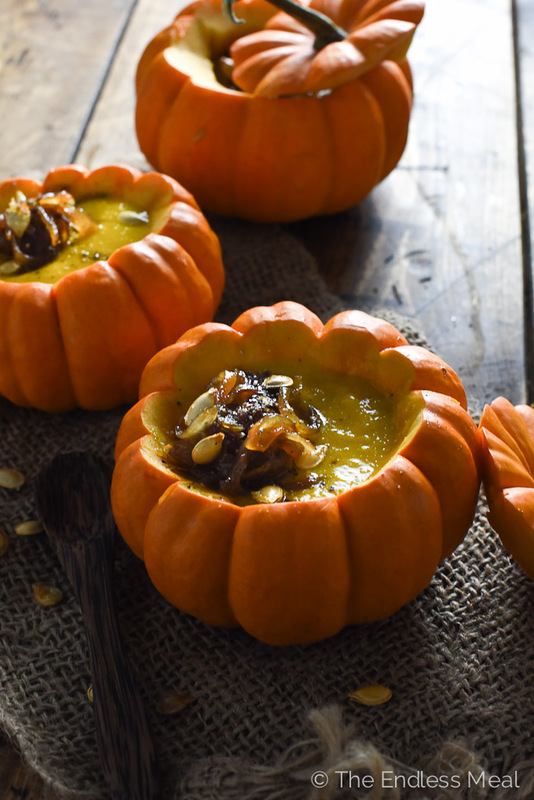 This is so pretty – I love the way you displayed the soup in a hollowed out pumpkin! I do not even know how I ended up here, but I thought this post was good.I do not know who you are but certainly you’re going to a famous blogger if you are not already Cheers! I’ve been lucky enough to attend a few of your Thanksgiving dinners over the years! I love this soup and the delightful way you serve it! 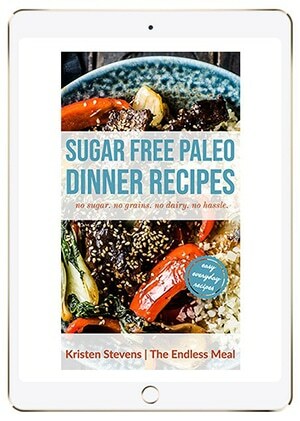 Hi Kristen, Melissa from Food Bloggers of Canada here. Just popping by to check out your blog and let you know we’ve added you to our Member Directory. Welcome aboard! Love the restaurant bucket list! Ditto…this is EXACTLY the soup I crave when the leaves start to turn yellow (same hue as the soup, btw). I love that the recipe has maple syrup…and that the caramelized onions stay in the soup (of course!! ).